Nigel Farage has said that UKIP leader Gerard Batten’s “obsessing over Islam and Tommy Robinson” is holding the party back in the polls. 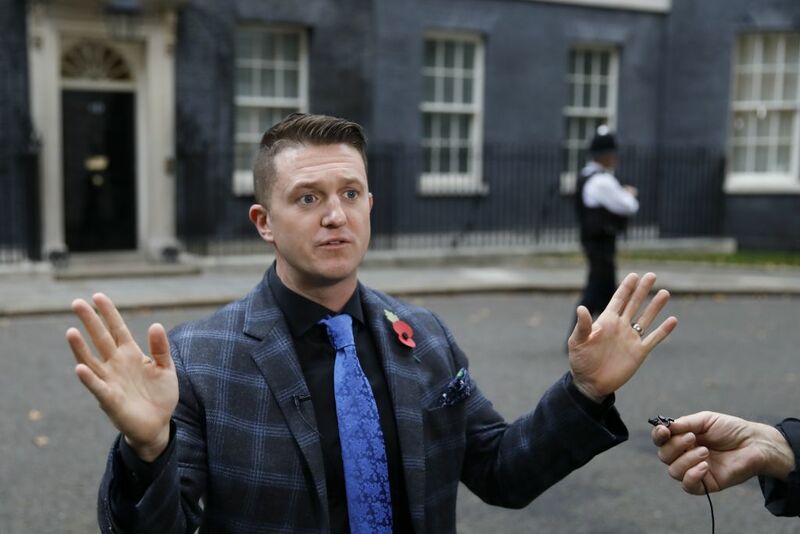 Over the weekend, the former leader warned that Gerard Batten appointing Robinson, real name Stephen Yaxley-Lennon, as an adviser, risked turning the party into the “new BNP”. Mr Farage joined Julia Hartley-Brewer to expand on his concerns, and said he felt “depressed” over UKIP’s current state. “Right now, there’s probably never been a more important time for UKIP, but the party is pretty much languishing,” he said. UKIP’s ruling NEC voted against a motion of no confidence in Mr Batten, but reiterated that Robinson was barred from becoming a member. Mr Farage also expressed concerns over the march on December 9, at which Mr Batten is scheduled to speak. Robinson will also appear. “This planned march and rally that’ll take place in Whitehall next week still continues with Gerard Batten and Tommy Robinson as speakers,” he said. “I’m concerned the leader of UKIP is getting involved in such things. “The gentleman organising next Sunday’s march was convicted in 2016 for an armed attempt to kidnap someone. The Telegraph reported on Sunday that one of the march’s organisers, 29-year-old Daniel Thomas, was jailed in 2016 after he and two accomplices attempted to kidnap a man at knifepoint, believing he had stolen drugs for them. Thomas told the Telegraph he had “turned [his] life around”. “What is your objection to Tommy Robinson? Many critics would say you’re very similar,” asked Hartley-Brewer. “I haven’t been to prison four times, that’s quite a good start” responded Farage. “When I ran UKIP for all those years, I made sure that nobody who’d ever been a part of the EDL or the BNP could be a member of UKIP. UKIP would lose support if Mr Batten’s association with Robinson continued, he said. “Right now, I think if the UKIP leader wasn’t focusing on issues like Islam - important though extremist Islamism is - if he wasn’t focussing on that and obsessing about Tommy Robinson, I think UKIP could be in a very powerful position in the polls. Mr Batten responded to the interview on Twitter, writing: "Nigel Farage failed to get the UKIP MEPs to even have a vote of no confidence in me last Wed in Brussels. He failed to get a vote through at yesterday’s NEC. Now he’s reduced to doing the rounds in the MSM attacking me. My crime? UKIP isn’t disappearing under my leadership." Nigel Farage failed to get the UKIP MEPs to even have a vote of no confidence in me last Wed in Brussels. He failed to get a vote through at yesterday’s NEC. Now he’s reduced to doing the rounds in the MSM attacking me. My crime? UKIP isn’t disappearing under my leadership. I have been in active politics for over 26 years. My cause is to restore democratic government under our Constitution, our laws & traditions, & under our democratically elected Parliament. Now the MSM mouthpieces are on the attack aided & abetted by Farage. Ask yourself why? Asked for his response to the tweets, Mr Farage said: "It all sounds a bit conspiratorial doesn't it? I’m not really interested in what he has to say. "I bitterly regret that we’re heading in the direction of consorting with people who under my leadership were not allowed a role in the party. ​​​​​"